Everyone always says what a lovely place this must be to work, and they are right, everyone who works both in Maison Rustic and our sister shop Antique Rose loves their jobs. What’s not to like being surrounded by beautiful things, chatting to our lovely customers and being in the heart of the town? 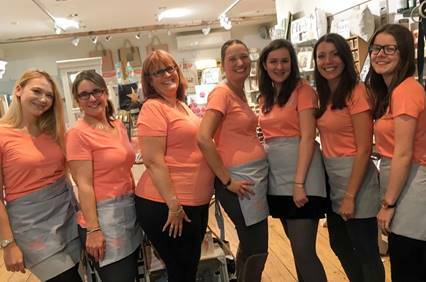 But the real reason we all love working at Antique Rose is the team, we are a work family who looks out for each other and we care, so support each other through the hard times and celebrate in the happy times. Working in our shops is not like working in a large retail business, when you work in a small business no two days are the same and you have to be prepared for constant change and hard work. Our Houseologists need to get to know our products and become interiors experts in order to serve our customers needs, then help them find the right products and our Antique Rose Giftologists are trained in picking out the perfect gift. Roles can be in both or one shop it all depends on the needs at the time. Everyone works part-time and our structure is pretty flat as we work as a team with little or no hierarchy. All team members are part time as it gives flexibility, it also means we can employ people with restrictions on availability and at all stages of life, there is always seasonal over time to plump up your hours. The longer you are with us the more the you will learn and the more you will earn based on your skills and achievements. 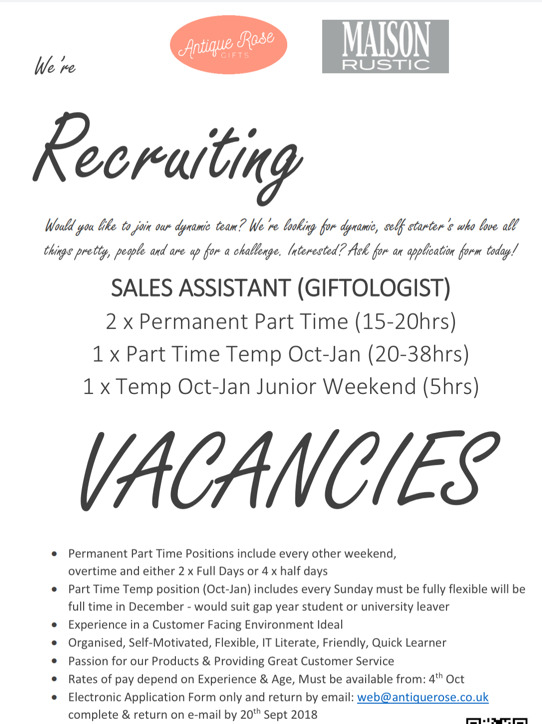 We also take on a small number of weekend staff suited to students and seasonal staff in the run up to Christmas, unfortunately, we don’t take on temporary summer staff as many of our previous Saturday staff fill this position when they come home from university. You will need to fill in an application form, we don’t take CVs, download a word format application form here fill it in and return it to web@antiquerose.co.uk before the deadline, You should hear if you have been selected for interview within 7-10 days. Unfortunately, we don’t take CV’s or peoples details outside of recruitment time, as you can imagine we get a lot of requests, so please only fill in when we have current vacancies.